Trusted, local provider of chiropractic care, delivering the highest quality chiropractic, rehab, and wellness services to relieve pain and get results! Locations in Memorial & Bellaire, Texas. Here at Active ChiroCare, our priority is you! From the moment you walk in the door to the end of your journey to recovery, our Houston chiropractors and staff are committed to providing you the highest quality chiropractic service and care. Come in today to either of our two conveniently located Houston offices in Bellaire and Memorial City to discover exactly what this means! Our goal is to help you lead a more balanced and fulfilling life. Our doctors and staff will provide everything from advanced chiropractic care and rehabilitation to customized nutritional counseling and lifestyle advice. We prioritize innovation to ensure that you always have access to the most up-to-date treatments. Houston is where the future of healthcare is happening so our doctors and staff constantly take advantage of this to learn the newest techniques and optimize your health. Let us help you create the healthy lifestyle you deserve through chiropractic medicine. Dr. Ton Ha has a great passion for the health and function of the entire body. Dr. Ha understands that our body can take stress and damage both inside and out, and uses nutritional supplementation along with chiropractic care to help the body rebuild from the inside out. Dr. My-Le Wolter is a pioneer in Chiropractic care, and has a great passion to bring healing to people who have been through stressful and traumatic experiences. When the body undergoes physical trauma or severe life stress, it is not uncommon for our lives to unravel physically and emotionally. Dr. Wolter is amazing! My dad was in a car accident a few years ago and saw Dr. Wolter at her old office. She treated him so well that he recommended I go to her new Houston office for chiropractic care after I injured myself last week. She is very attentive and ensures her patients get better through the treatment she provides. She’s also very friendly and always explains exactly what she is doing. The office interior is very modern and I love it! I would 11/10 recommend Dr. Wolter and will definitely come back if anything were to happen to me in the future. Dr. Wolter is the best! She is so attentive and always makes sure her patients are feeling great, both physically and mentally! Dr. Ha is a wonderful chiropractic doctor. 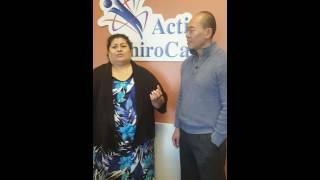 I had a neck and back injury from a car accident and at first I was skeptical about chiropractic care, but he is a very good doctor. His staff is just as great and they always greet you with smiles. 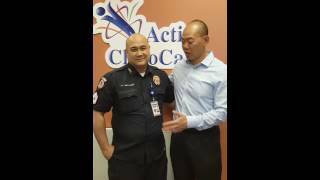 Thumbs up for Active ChiroCare! Dr. Ha is an amazing chiropractor. He is professional, friendly, and always happy to engage in small talk as he works through his adjustments and checkups. I started coming near the beginning of the year to get an old back injury that was flaring up treated. I had tried to ignore it but it just grew worse. Within two weeks with Dr. Ha I was immeasurably better. Fast forward to today and I’m still paying him a visit once a week for a maintenance adjustment. The drive home after my adjustment is usually the highlight of my day— my back feels great! Do yourself a favor and check this place out. I’m glad I did! 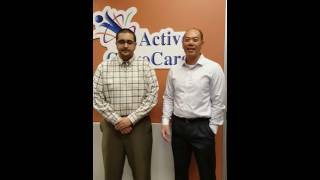 I just started going to Active ChiroCare to get treated for my pain due to a car injury and so far I love the place. You are attended to immediately, so there’s never a wait time when you are just sitting. The only time you aren’t active is when you are consulting with the doctor, which is a different appointment, but still not a lengthy portion of treatment. The staff is great and always makes you feel comfortable and welcome. I went to visit Dr. Ha with a lot of pain in my back when my regular chiropractor was not available. Although I was a new patient, the doctor took the time to evaluate me and made special accommodations to take me in the following day when he normally does not see patients. After my first visit, I experienced a tremendous relief of pain and was once again able to function. He’s very thorough, explains everything clearly, and is focused on the overall care and comfort of the patient. I highly recommend this chiropractic office and its staff.